After breakfast, drive from Leh to Pangong past Shey and Thiksey – the mound of earthen monastic dwellings, crowned by the Gompa. At Karu, which is a junction, you take a detour and start ascending to cross the Ladakh range over Chang-La 5, 475 M / 17950 ft. At the foot of the pass on the other side we reach Tangse village. The valley is blessed with a beautiful stream flowing through it, originating from the lake, giving a greenish tincture to the otherwise dry landscape around. Later drive back to Leh. 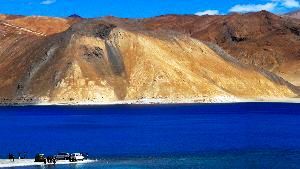 On the way back, visit the Sindhu Ghat for Sindhu Darshan and walk along the river, Shey monastery, Thiksey monastery, Hemis monastery – the most powerful monastery in the Ladakh region. Rancho’s School – Got Famous by a super hit movie 3 Idiots. Reach Leh by evening. Dinner and overnight in Leh.